At my next meeting with him, on 9 February 1990, we discussed his imminent release, scheduled for 11 February. He was initially taken aback and insisted that the release would have to be delayed to give the ANC time to make the necessary arrangements. I said that that would not be possible but, in a spirit of compromise, agreed that he would be able to choose the place of his release. He chose Cape Town. In the years that followed, it was an honour for me to have been able to work with Mr Mandela in the process that led to the adoption of the interim Constitution and our first democratic elections in April 1994. Although we were political opponents -­ and although our relationship was often stormy -­ we were always able to come together at critical moments to resolve the many crises that arose during the negotiation process. During his presidency, Mr Mandela did indeed use his great responsibility to assure South Africans from all our communities that he had all their interests at heart. He made a unique contribution not only to the establishment of our constitutional democracy but also to the cause of national reconciliation and nation-­building. 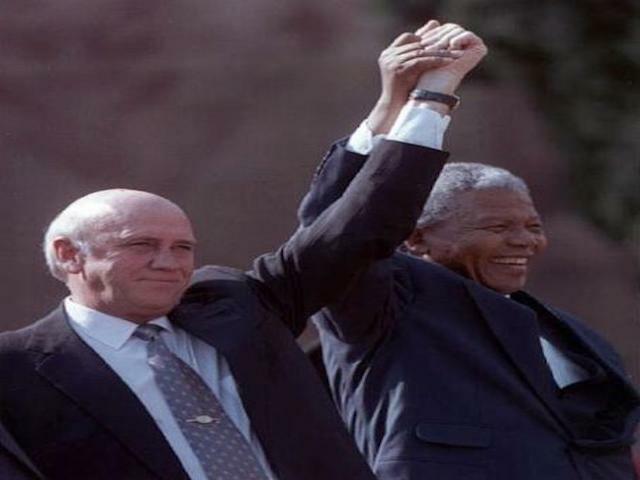 Even in his well-­deserved retirement he continued to be a force for reconciliation and social justice -­ not only in South Africa, but throughout the world. In later years, when we had both retired from the hurly-­burly of political life, my wife Elita and I became friends with Nelson Mandela and his wife Graça Machel. Nelson Mandela’s courage, charm and commitment to reconciliation and to the Constitution, were an inspiration not only for South Africans but for the whole world. I believe that his example will live on and that it will continue to inspire all South Africans to achieve his vision of non-­racialism, justice, human dignity and equality for all. Tata, we shall miss you -­ but know that your spirit and example will always be there to guide us to the vision of a better and more just South Africa. Issued by the FW de Klerk Foundation Cape Town, 6 December 2013.